Advanced Micro Peripherals’ video products allow designers to implement efficient, reliable solutions for a wide range of rugged, demanding applications. But what are these applications, and how are AMP’s hardware and software products deployed within them? 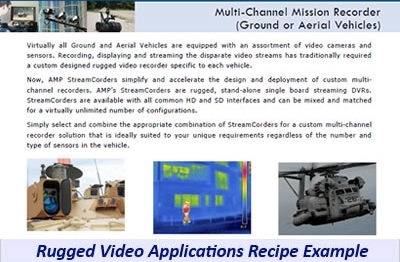 AMP’s Rugged Video Applications offers practical, real-world answers to these questions. It shows how AMP’s products are already being used in many different situations around the world. We invite you to browse the examples shown and find inspiration for your own project, however demanding it may be.